We explain some of the tricks and composition methods opened up by Sonar 8.5's new Matrix view. The various features Cakewalk have added to Sonar over the years are generally consistent with the DAW (Digital Audio Workstation) way of working, which makes the new Matrix view all the more interesting, as it's based on encouraging a more 'live', improvisational playing style. Does it look as though someone at Cakewalk has been spending time with Ableton Live? Yes, but go beneath the surface and there's a subtle difference in philosophy. 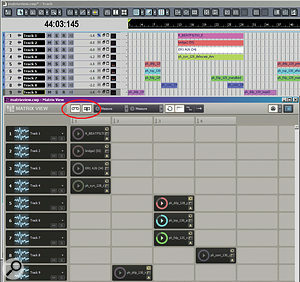 Whereas Live gives you the option to switch between the Matrix‑like Session view and a traditional, linear Arrangement view, Cakewalk have integrated the Matrix view as a sort of audio step sequencer within the Track view. The results you can get from the two programs may be similar, but the way you get to those results is somewhat different. The Matrix view is a matrix of cells arranged as rows and columns. Each cell can hold an audio file, step‑sequencer pattern, MIDI groove clip, REX file (with native import), or Project5 pattern file. You can also drag in a groove clip that's already in a project. When you trigger a cell, via mouse, computer QWERTY keyboard or MIDI remote control, it can start playing immediately, or you can quantise playback to a rhythmic value — so that, for example, it won't play until beat one of the next measure. Only one cell can play at a time within a row. Triggering another cell in a row — including a blank one, if desired — cuts off the currently playing cell, and that cut‑off can, again, be quantised to a rhythmic value. However, if you trigger a column, all cells in that column (which are in different rows, of course) will launch. This is equivalent to launching a Scene in Live. Even with a column triggered, though, you can still trigger individual clips in other columns and rows. That should give enough background to let you understand the rest of this article, and the on‑line help within Sonar will help you to learn more about the nuts and bolts of the Matrix view. It's important to understand that the Matrix view doesn't produce any sound by itself: you need to assign the output of each row to an audio or MIDI track so you can hear what's going on (with a MIDI clip, this means that the MIDI track needs to feed a synth as well). The first clip dragged into a row determines whether the row is a MIDI or audio row, with Project5 PTN files being MIDI‑based. Although you can assign several rows to the same track, there's no level control for rows, so any loops are fixed at the levels at which they were recorded. Because there's an unlimited number of rows, and Sonar accommodates an unlimited number of tracks, you're probably best off creating a new track for each row, so you can use Sonar's track controls for volume, panning, and the like. MIDI is somewhat different, as there may be times when you want to build up complex MIDI parts by routing several MIDI rows to a MIDI instrument. For example, I've had good results from feeding several Project5 acoustic guitar patterns into a single instance of the AAS String Synthesizer, or individual drum loops (kick, snare, hats, and so on) into Session Drummer 3. When auditioning a sample library, the 'keeper' loops have been placed in a column along with a drum loop, while other drum loops are in the same row but different columns for easy comparison. 1. 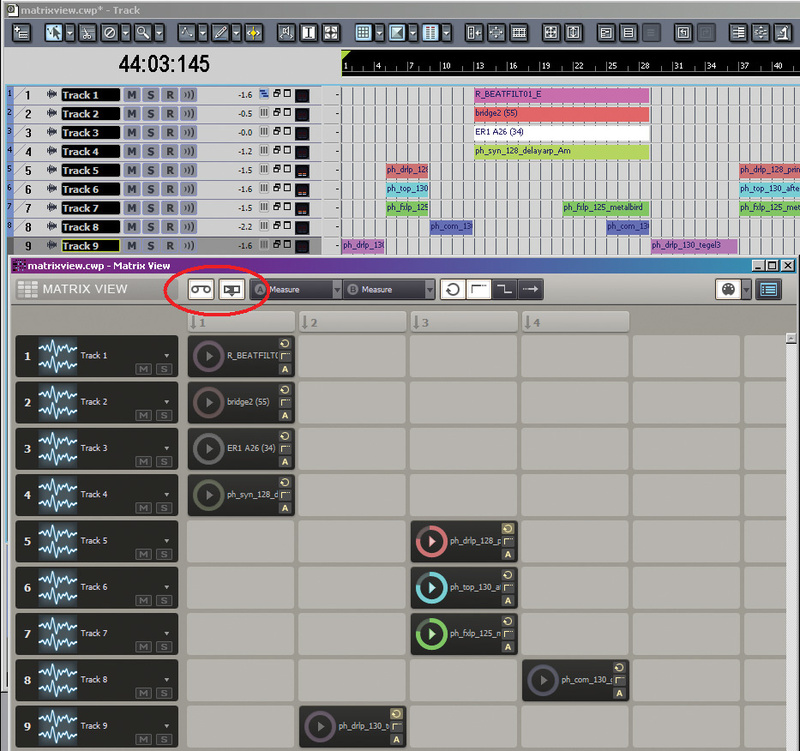 Place the drum loops sequentially in a row, starting with the column with the loops that are your 'keepers'. If you select multiple loops and drag them to a cell while holding down the Shift key, the drums will all be assigned sequentially to the same row, starting at the first cell to which you dragged the loops. 2. Click on the column and listen to how the loops work together. 3. Click on the drum loop in the next column over. As soon as it triggers, it will cut off the drum loop currently playing. 4. Click on the drum loop in the next column over and, like the previous loop, it will cut off the current drum loop. 5. By clicking back and forth among the three drum loops, you can figure out which works best with the other loops. Here's where it really gets interesting. Imagine you're clicking around, checking out different loops, and you start feeling that you've got the beginnings of a track. Maybe you clicked on a synth loop, then a few measures later you clicked on a bass loop, and they sounded great together… so you let them play together for a couple of measures, then brought a drum loop crashing in, and then turned off the synth loop. It sounded good, but now you have the task of transferring those loops over to the project and re‑creating what you did. Or do you? Not with the Matrix view, if you do the following: The Capture Matrix Performance and Follow Transport buttons have been circled in red for clarity. Coloured bars in the Track view indicate where clips have been triggered in the Matrix view. After recording, the bars show actual waveforms. 1. Before you start playing, click on the Capture Matrix Performance and Follow Transport buttons. Note that you can't initiate Capture mode when the transport is playing: it has to be stopped. 2. Start the transport by clicking on the Play button. If you trigger a column before clicking on Play, the loops will wait until playback starts, then start right on the first beat. 3. Click on your loops and create some music! You'll see the tracks filling up with coloured bars to indicate that loop sounds are being recorded. 4. After you're done with recording, click on the transport Stop button. The coloured bars turn into waveforms, and voilà — your playing has been recorded into the project, and the clips can now be treated like any other groove clips: rolled out, processed, edited, or whatever. Once you stop recording, the Capture Matrix Performance button turns off, so remember to turn it on again if you want to do additional recording. Which, of course, you can do: simply place the Now time where you want to resume recording, and go for it. If you record a new clip over an existing clip because they were both assigned to the same track, both clips will remain in the track and play back simultaneously. Turn on track layers, and you can see both clips and edit them. There is one disappointing thing, though: clicking on the mute button looks as though it's turning off the clip while recording, but it's not, and the solo button is also ignored while recording. Ableton Live has the same annoying habit with respect to recording the solo button. I've often said that I never boot up Live without a controller attached, and I'm feeling the same way about the Matrix view. To set it up with a controller, you can right‑click on a column header or cell, then choose MIDI Learn from the context menu for the selected target. If you're using a keyboard, I find that assigning the white keys to columns and the black keys to individual cells works well. The MIDI Learn function enables remote MIDI control of cells and columns. If an asterisk appears next to MIDI Learn, it means there's already an assignment. However, I've also tried out Novation's Launchpad controller (designed for use with Ableton Live) and, sure enough, it can trigger cells through its Automap function. The Launchpad's 8 x 8 matrix is ideal for this type of application. I also tried using Akai's APC40, but its clip‑launch buttons are mapped in a way that's not really compatible with Sonar's Matrix view. I didn't try any MPC‑style 4x4 controllers (like NI's Maschine), because I'd almost certainly want to use more than four rows of columns or cells, as I imagine most people would. There are lots of other tricks that the Matrix view can open up to you, so do take the time to read the on‑line help. Before I sign off for this month I'll also mention that you should download the 8.5.1 update, as it fixes some Matrix view issues present in version 8.5.